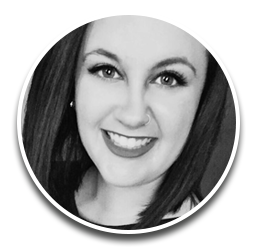 Editor’s note: Hey there! It’s been a while, I know. While preparing the 2017-18 anthology for publication and working on taxes on top of everything else, I haven’t had time to do what I said I would this year: go through and update old blog posts. It’ll happen, but for now, I have an eager writer who wanted to share something. 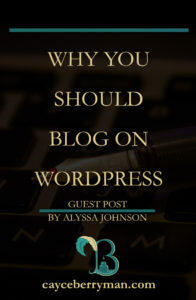 Alyssa Johnson wanted to share with writers a few thoughts on why you should start a blog on WordPress. If you have a site and want to start sharing information with your readers, keep reading! Be aware, though, that this is not a post about how to create a blog by installing WordPress. WordPress (WP) has recently become one of the most wanted online platforms for bloggers. This unique system allows publishing posts by means of a very convenient menu and special utilities. WordPress uses distinctive categories and tags to organize the content; thus, it is also easy to place or find a certain post. When you only take your initial steps in WP web development, you should learn how to start a blog. WordPress is one of the blog sites with easy and convenient settings and terms of usage. It is important to be aware of the way the system operates to make full use of WordPress. Getting your first website can be easy. The first thing you should create is your domain name, which remains the exact address people type to visit your blog. Once gaining your domain, you can start to build your blog. You should install the WordPress by selecting your domain name. The installation procedure is quite convenient and does not take a lot of time. After dealing with installation, it is time to select themes and other details. These are rather technical issues when the most important is to provide a great content making your website a successful blog. When you deal with the issue of how to become a blogger, it is important to keep in mind that the success of your blog depends on the content you post. Since WordPress organizes your content by means of special categories and tags, it is always convenient to reach the needed article or text. Moreover, it helps your readers to find your posts as well. When it is your first blog on WordPress, tags and categories can help you gain more visitors who enjoy certain topics. The blog-creating process is rather easy when you adore working with text. Besides, your personal site can allow you demonstrate not only your writing skills but other talents as well. Online blogging requires a high level of creativity, thus, the more you pay your efforts to create unique content, the more positive feedback you get. WordPress allows selecting various themes, using numerous filters, and customizing the entire website appearance to gain more visitors. Placing your posts is easier than it has ever been before. You just have to be interested in what you are writing about and what content you post. If you are writing a business plan, you need certain tools like graphics, pie charts, and economic research to make it more vivid. WP brings a bunch of instruments that ease your virtual blogging. With all the plugins and customization features, your site will look perfect. If you are willing to become a popular blogger, you have to be creative in reading and commenting on other writers’ articles as well. Linking to other authors will also be very useful for your online popularity. You can subscribe to a bunch of interesting blogs and get many potential readers. Besides, if you select to use all your creativity and talents, your site can become an original one. You can adjust your WordPress website anytime you want it. With such a purpose, you should test all the possibilities WP provides you with, and get closer to the main system’s tutorials you can get online.